Advance Auto Parts INDYCAR Radio Network broadcasts: Mark Jaynes is the chief announcer alongside analyst Anders Krohn. Jake Query and Nick Yeoman are the turn announcers with Dave Furst, Rob Howden and Ryan Myrehn reporting from the pits. The INDYCAR Classic race airs live on network affiliates, Sirius 216, XM 209, IndyCar.com, indycarradio.com and the INDYCAR Mobile app powered by NTT DATA. All NTT IndyCar Series practices and qualifying are available on IndyCar.com, indycarradio.com and the INDYCAR Mobile app, with qualifying also airing on Sirius 216 and XM 209. 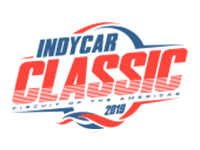 The INDYCAR Classic will be the first Indy car race at Circuit of The Americas and one of two NTT IndyCar Series races to be held in the state of Texas in 2019. Texas Motor Speedway, which has hosted Indy car racing since 1997, will host its annual race in June. Josef Newgarden of Team Penske started the NTT IndyCar Series season by scoring the win in the season-opening Firestone Grand Prix of St. Petersburg on March 10. Newgarden seeks to be the first driver to open the season with back-to-back wins since 2010, when his teammate Will Power won races at Sao Paulo, Brazil and St. Petersburg, Florida. Scott Dixon of Chip Ganassi Racing continues the defense of his 2018 NTT IndyCar Series championship at COTA. Dixon’s five season championships trail only the seven titles collected by A.J. Foyt. Dixon is third on the all-time Indy car victory list with 44. Tony Kanaan seeks to start his 302nd consecutive race this weekend, which would extend his Indy car record streak that began in June 2001 at Portland. Kanaan will attempt to make his 362nd Indy car start, which ranks third on the all-time list. Scott Dixon has made 242 consecutive starts heading into the weekend, which is the second-longest streak in Indy car racing. Andretti Autosport’s Marco Andretti has made 218 consecutive starts, which is the third-longest streak in Indy car racing. Six rookies are entered and two – Kyle Kaiser and Patricio O’Ward – will make their first NTT IndyCar Series start of the season. The other Rookie of the Year candidates are Marcus Ericsson, Santino Ferrucci, Colton Herta and Felix Rosenqvist. Since 2012, the NTT IndyCar Series has averaged nine different race winners per season, including a record-tying 11 winners in 2014. There were eight different winners in the 17 races of 2018 with an equally tight competition projected for this season. Drivers may engage their “push-to-pass” for a total of 200 seconds during the race, with a maximum duration of 20 seconds for any one The push-to-pass is not available on the initial start or any restart unless it occurs in the final two laps or three minutes of a timed race. The feature increases the power of the engine by approximately 60 horsepower for 2019.